This year is a particularly big one for English Heritage, being the 100 year anniversary since the British Government began to take responsibility for preserving the physical remnants of the nation’s rich history. That responsibility took the form of the Ancient Monuments Consolidation and Amendment Act 1913 which, for the first time, gave the Office of Works the power to issue compulsory protection orders, where previously it could only protect those buildings whose owners volunteered to enter the scheme. Although such an order no longer requires an individual Act of Parliament to establish it every time, as it once did, the current English Heritage powers are not too far removed. Recent news, however, has highlighted their inadequacies when dealing with works of art in which a building is the canvas and too many, campaigners say, have fallen into disrepair or disappeared altogether. The Twentieth Century Society is leading the campaign to protect murals created in the post-war building boom. This rich sector of art has been severely eroded over time, with redevelopments and renovations frequently paying no consideration to the artwork. Schemes like the Rebuilding Schools Programme meant the demolition of a number of schools, a common location for murals, and the recent recession and economic difficulties have meant that few local authorities have the time or money to invest on public artwork maintenance. Recent notable casualties include Ray Howard Jones’s ‘An Eye For The People’ on the Western Mail building in Cardiff and Robert Lenkiewicz’s huge Elizabethan mural on the Barbican (Plymouth) which is now just a faded memory of its former glory. A mural at the Welsh seaside town of Colwyn Bay has recently been rediscovered. 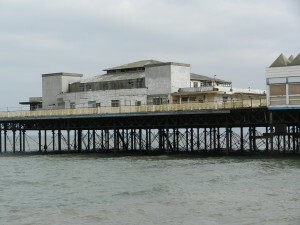 The local council has uncovered the remains, dating from the 1930s, on its derelict Victoria Pier (pictured right). The wor ks by artists Eric Ravilious and Mary Adshead had been covered in both wallpaper and a thin layer of plaster, but a bid is now in with the Heritage Lottery Fund to restore both the pier and the murals. English Heritage does include several murals on its protected ‘Heritage List for England’, but the vast majority are merely sections of wider listed buildings. To afford proper protection to the artwork murals that still remain, English Heritage will need to look at protecting them in their own right and forcing local authorities to act. In a time of extremely difficult budget balancing for councils all over the country, with some (like Somerset County Council) having removed all art funding entirely, this will no doubt be extremely difficult. Unless another option is tabled or local communities can band together to protect their local masterpieces, the unfortunate outcome will be the further deterioration of the history of British art.